The 51-year-old musician joined singer Axl Rose, guitarist Slash and bassist Duff McKagan at their gig at the Paul Brown Stadium in Cincinnati on Wednesday (06.07.16). So far drummer Frank Ferrer has been wielding the sticks for the band on their 'Not In This Lifetime... Tour' - which reunited the original trio for the first time in 23 years - as Adler was reportedly unable to fulfil live duties due to back surgery. Adler played on two songs, 'Out Ta Get Me' and 'My Michelle', where he joined Ferrer as a second drummer. 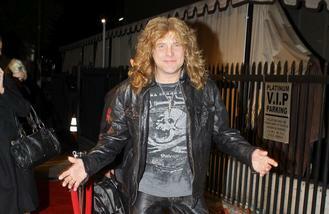 Adler, 51, originally left the band in 1990 because of drug addiction, and was replaced by The Cult's Matt Sorum. The band have long had a reputation for bust ups over the years, but since they regrouped for this year's Coachella Festival in California in April it has been a harmonious reunion. The only member of the classic line up yet to make an appearance is rhythm guitarist Izzy Stradlin, and it seems he is unlikely to join his former bandmates any time soon. Back in March, the 54-year-old rocker told Rolling Stone: "At this point in time, I will not be playing at any of the April 2016 GNR shows. I've also not been in the studio recording or writing with any of the others recently. There is so much speculation, but so very little info, [that] I thought I should reach out."